Here we make available the code employed in our team’s submissions to the 2015 Emotion Recognition in the Wild contest, for the sub-challenge of Static Facial Expression Recognition in the Wild. The objective of this sub-challenge is to classify the emotions expressed by the primary human subject in static images extracted from movies. We followed a transfer learning approach for deep Convolutional Neural Network (CNN) architectures. 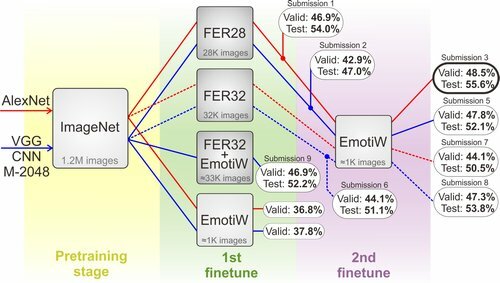 Starting from a network pre-trained on the generic ImageNet dataset, we performed supervised fine-tuning on the network in a two-stage process, first on datasets relevant to facial expressions, followed by the contest’s dataset. Experimental results (see paper below) show that this cascading fine-tuning approach achieves better results, compared to a single stage fine-tuning with the combined datasets. Our best submission exhibited an overall accuracy of 48.5% on the validation set and 55.6% on the test set, which compares favourably to the respective 35.96% and 39.13% of the challenge baseline. We also provide additional models that were trained on the FER-2013 Original Training Data, validated on the FER-2013 Public Test Data, and finetuned based on two convolutional neural network architectures (AlexNet and VGG-CNN-M-2048). They achieve an overall accuracy of 64.74% and 66.44% on the FER-2013 Public Test Data and 65.10% and 67.70% on the FER-2013 Final Test Data, respectively. The code and models are released under a creative commons license. Caffe platform is required in order to load and test the models. To reproduce the results from the contest, you will have to obtain a copy of the EmotiW dataset from the organizers. The zip-files are encrypted; please email us for the password. H.-W. Ng, V. D. Nguyen, V. Vonikakis, S. Winkler. Deep learning for emotion recognition on small datasets using transfer learning. Proc. 17th ACM International Conference on Multimodal Interaction (ICMI), Emotion Recognition in the Wild Challenge, Seattle, WA, Nov. 9-13, 2015. Please cite the above paper if you use our code. Last modified 21-Jan-2019. We welcome your comments, chocolate, and hard currencies.